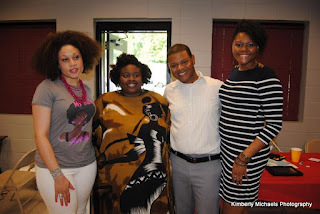 Dublin Park (meeting rooms) was the venue for my first natural hair event and it was great. It was large enough to accommodate everyone but small enough to make the atmosphere feel cozy. There were a few hiccups with the venue, chairs and tables not being set up and the space not being cool enough, but overall I am glad I chose it. My panel of Q & A guests was another decision I am truly happy that I made. 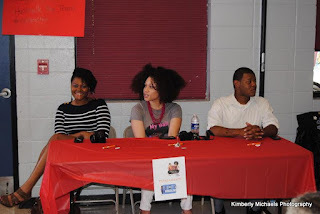 The first person I added to my panel was Orlando to represent a stylist perspective but next I wanted someone with a Facebook presence and someone that had documented their own natural hair journey in a public way. The first person that came to mind was Tarika from the Pursuit of Nappiness. 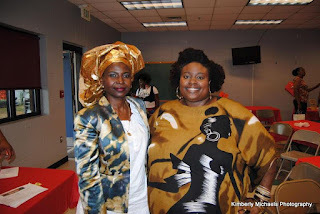 I had seen photos of her at many events and had the opportunity to meet her in Atlanta at Fro Fashion Week. I learned she had a Huntsville past so I reached out and without hesitation she accepted. Tarika helped get the word out about my event and made herself available to me for advise or any help needed to make the event happen. I thank you Tarika for making time for The Queen in Me event and traveling to Alabama to let my attendees have a chance to learn from you and also see the beauty you have inside & out. The last piece of the panel puzzle was a YouTube representation. and this was the hardest for me. My budget was very small so I couldn't afford travel accommodations or fees so I needed to have the prospective guest live within a few hours distance. I first reached out to one of my favorite bloggers/vlogger LexiWithTheCurls but she was unavailable. I reached out to about five other talented women but no luck so just when I had decided I would just have to do double duty as host and panelist my cousin Tawana answered my S.O.S. She suggested I add Ja'Lissa ,one half of the YouTube duo 4Mysisterz. Ja'lissa lived here in Huntsville and when I reached out she said Yes! She worked out well on the panel and the three of them did their best to provide the attendees with answers to their many questions. A big thanks to you Ja'Lissa for agreeing to be on the panel, taking lots of pictures with everyone and bringing sunshine to the event with an amazing smile and personality. My vision of The Queen in Me natural hair event became complete when I was introduced to Daba. 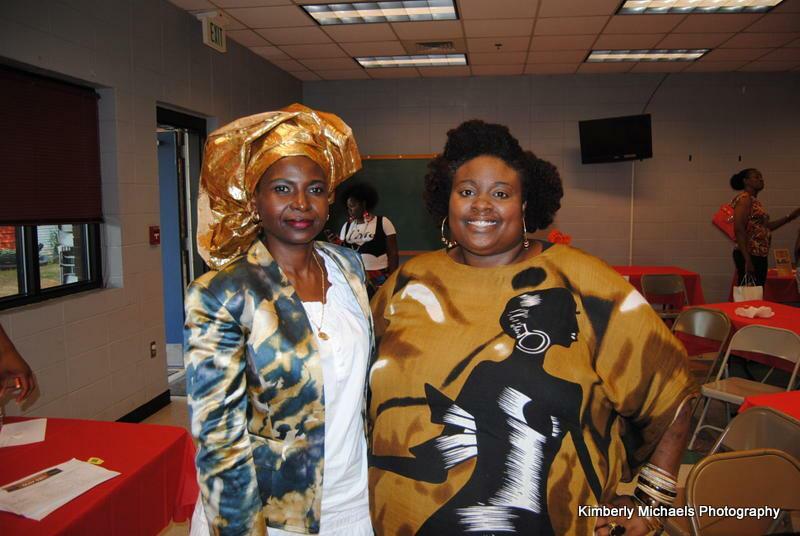 She is the owner of Nissi Braids at 1305 Pulaski Pike in Huntsville and agreed to attend my event and share with the attendees about her country and how to create African Hair wraps. She did an amazing job and we truly built a bond. 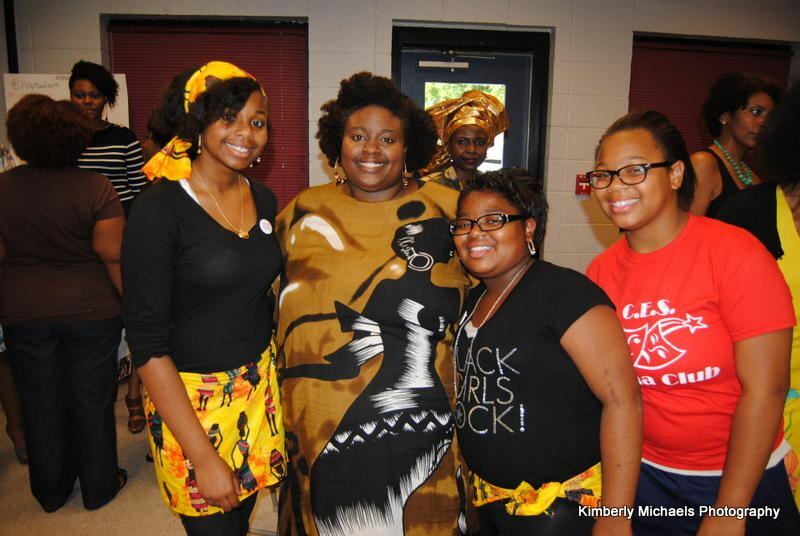 I felt an authentic African presence was a must and she exceeded my expectations! A millions thank yous to you, Daba! I must end this post with a thanks to my husband for dealing with me, attending the event and working hard to help me get everything in place. I know that this consumed me and I appreciate your understanding and patience. I want to thank my mother for not letting me quit and believing in me and this event from the beginning, my friends for not deleting me on Facebook and twitter for the months of updates about the event, my teenage wonderful volunteers; My daughter Tia and her friends Kortessa, Kashya & the unexpected bonus Jurney and my son Jalen for manning the Swap table and being a great sport! Tomorrow I will conclude this 4 part post with the thanks to the Fabulous sponsors and the details of The Queen in Me - NNHMD Huntsville event! It truly takes a village and I am grateful that mine is vast and strong! Leave your comments, I enjoy them all!